Decide Today to Put Yourself on the Flight Deck! Have you always wanted to be an airline pilot? Your timing is excellent! Looking ahead over the next 3-5 years, it is expected that the airline industry will face a shortage of qualified pilots, fueled by retirements of “boomer” age pilots and growing passenger travel. Act now and you may soon be flying as a copilot for a charter or commuter air carrier. Brampton Flight College, the professional training arm of Brampton Flight Centre, is an aviation career training organization with a proven track record, dedicated to producing qualified pilots, job-ready for charter and commuter operators and familiar with current industry expectations. The goal is accomplished through the delivery of an advanced aviation curriculum, the One Year Professional Pilot Diploma Program, developed in consultation with Transport Canada, air carriers, line pilots and the Air Transport Association of Canada (ATAC). The Professional Pilot Diploma Program has been designed to meet the flight crew skill needs of charter and commuter airlines as suggested by ATAC in human resource studies of the industry. Students receive training in flight and ground school subjects as prescribed by Transport Canada, and advanced airline training patterned on standardized Initial Training provided by air carriers to new hire pilots. As well, the Program provides trainees with insights into getting a job in the industry through aviation business familiarization, resume preparation, interviewing tips and practice, airline “sim ride” training and networking opportunities with active airline pilots to further career goals. It is BFC’s practice to offer the top graduates (25%, maximum 3) each year jobs with Brampton Flight Centre as instructors. Brampton has an excellent industry placement record; graduates are flying with many airlines in Canada – Air Canada, CargoJet, Porter, Jazz, Air Georgian, Kelowna Flightcraft to name a few – and with other carriers internationally. As well, Andy Midcalf (2006-07 class) and Francis Yannuzzi (2005-06 class) were back-to-back winners of the Webster Memorial Trophy competition (sponsored by Air Canada) as best amateur pilots in Canada. Candidates with post secondary training or working experience are typically more successful in this highly demanding ground school and flight-training environment. Applicants are also evaluated on their commitment to personal excellence and their ability to conduct themselves in a professional manner, befitting the professional nature of airline flying. The Program will appeal to career oriented individuals who wish to acquire an edge in the highly competitive world of professional aviation. Perhaps you are presently attending university or college and always wanted to be an airline pilot. 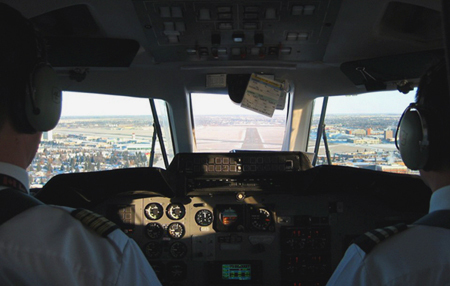 Why not consider the Professional Pilot Program as a one-year post grad option? Or perhaps, you have already completed some Private Pilot License training – typically your flight time would be credited towards the Program. Why Select Brampton Flight Centre?